Our customary 12-oz. glass, 33% larger than the 8-oz. industry standard, contains a 1.5-oz. pour of your favorite liquor which, before ice, provides the ideal mixer-to-alcohol ratio of 3 to 1. Professionally maintained by our vendors, our draft system is flawlessly maintained and regularly cleansed. Our staff is trained in proper serving techniques for specific and seasonal tap offerings. Bottled beers are continually checked for freshness dates and ample product rotation. Our state-qualified, professional mixologists always hand-craft your mixed and blended drinks, never using imitation ingredients or inferior mixes. All products and ingredients are fresh and of the highest quality, ensuring delicious and potent results. Upon entering, the door will be opened for you, followed by a smile and cordial greeting. Need help with a cab or any other issues? Just ask! Specially-trained, with many years’ experience in the nightclub industry, our managers are highly qualified professionals proficient at handling any and every situation. Feel free to approach them (or any staff member) with questions, suggestions, comments or complaints. Their passion for music, rhythm and working the beat guarantees you a stimulating night of nonstop dancing. We are constantly updating our vast music portfolio with the newest artists and hits, with both sound and lighting effects unparalleled in the industry. 7. Every Reason to Become a Regular! Just one visit will make Hunters your nightclub of choice. That’s our promise. Hunters Nightclubs has joined the “Skip the Straw” initiative and will provide straws upon request only. Our goal is to reduce the use of plastic straws, a single-use plastic that litters beaches, pollutes oceans and harms wildlife. 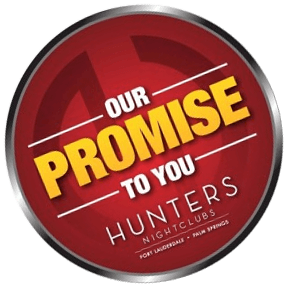 Learn about Hunters Nightclubs® dedication to providing every patron a thoroughly enjoyable entertainment experience!